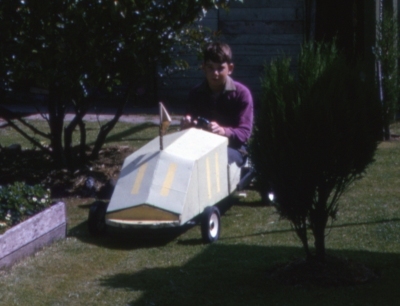 While my father Keith is standing proudly next to me, he didn't have much to do with the construction of this billycart. The photo is taken in the garden at 120 Wright Street, East Devonport Tasmania. This was my first model with a steering wheel - in the joy of construction, I neglected to get the rope around the steering column the right way. As a consequence, when you turned left, the cart went right and vice versa. So my mates and I tried it out, and yes it was controllable, but not in an emergency. As soon as anything unexpected happened, instinct took over and the driver immediately turned the wheel away from the emergency - with predictable consequences!!! It was much better once I reversed the steering. This cart was very easy to tip over, a consequence of the high center of gravity and the narrow track. All of my carts since then have been much lower and wider. You can't see in this photo, but the number "13" is proudly painted on the side. This is because I had (and still have!!) a book on racing cars which included a story called "Old Thirteen" about a racing car that was uncontrollable unless you drove it flat out!!. Engineering wise this doesn't make sense, but it did impress me as a little boy. It has a swinging front axle and a hand brake acting on one rear wheel. The wheels are from a lawnmower, and run on nylon bearings on steel axles. The flag and the paint job make it look quite swish. My dad organised to give it to someone in Devonport when we left for Hobart. I guess it has long since disintegrated. It was at least 30 years before I made another cart, prompted by a request from my daughter Phillipa. This is Ben Methorst racing in the upgraded "Bush Basher". Originally built by David Edwards with steel reinforced plastic golf buggy wheels, this version has 12" pavement cycle wheels with rear caliper brakes. The steering uses parallelogram geometry, with a rope link between the steering column and the front track rod. The modifications were performed by John McCulloch. 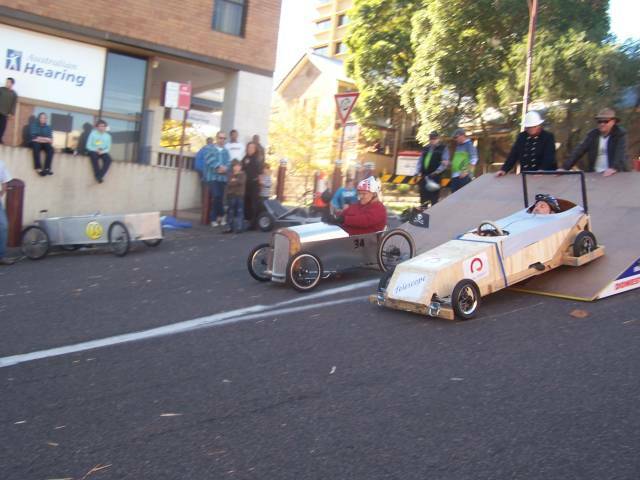 The picture was taken at the 29 March 2006 Billycart Derby at the Technopark. 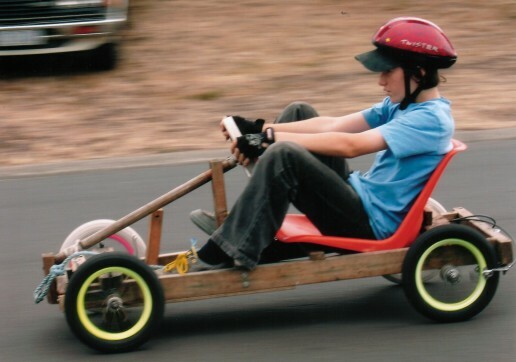 With the new wheels and steering, Ben came first in his division. Top speed was probably about 50 kph. Note the colour coordinated wheels and tyres. There is no speed sensor. 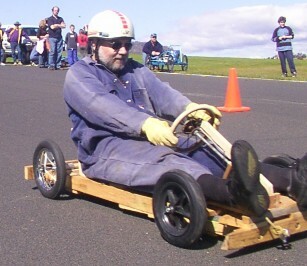 This is David at the 2004 Baskerville Racecourse Billycart Derby. This cart is the third version of the "Speed Machine". It has 12" pavement cycle wheels on the back and 12" plastic rim golf buggy wheels with commercial bearings on the front. The first version of this cart used ball bearing golf buggy wheels with soft non-inflatable tyres front and rear. It was quite slow. The second version used plastic rims with commercial bearings on the rear, but left the golf buggy wheels on the front, and was somewhat faster. The third version shown in the picture was faster again, reaching about 45 kph. The steering uses a pivoted beam above the chassis with broomstick and rope steering. 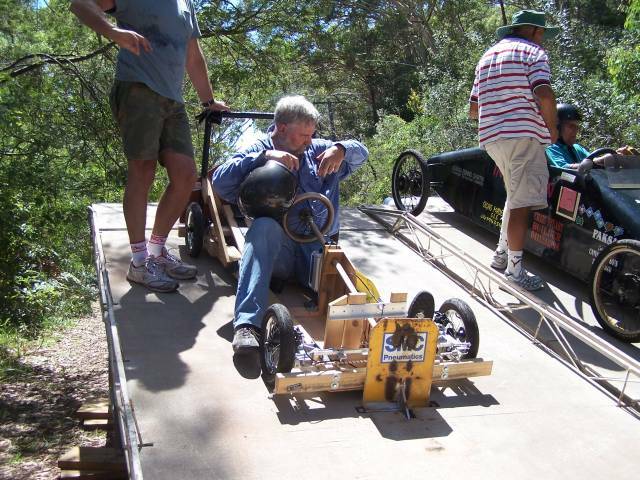 The cart was constructed by David Edwards with help from Mike Meerding who helped insert the bearings in the front wheels. A bike speedo is mounted just in front of the steering wheel, with the sensor on the right hand rear wheel. This is David in his fourth cart at Baskerville Racecourse on 1 October 2006. This cart is designed to have a lower profile, and hence less wind resistance, and to be more stable at speed. This is aided by the longer wheel base. The steering geometry is true Akerman, with separately adjustable toe in and steering rope tension. The front king pins are parliament hinges mounted on the 4" x 2" side frames. This allows the driver's heels to sit on the floor. Braking is by calipers on all four wheels, with a three balancing beams to ensure that the braking load is distributed evenly over all four wheels. Accessories include a speedo and an air horn. This cart reached about 50 kph down the Baskerville Hill. 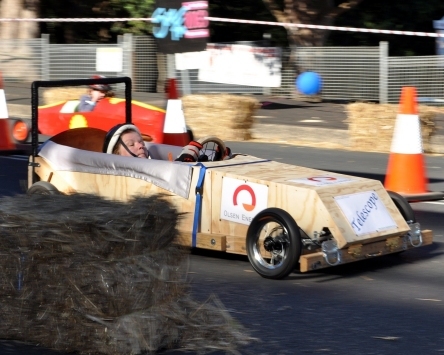 This photo was taken at the 10th Technopark Billycart Derby. David's fastest cart (so far) is in the foreground, and can be compared in size with his third speed machine in the background. The longer wheel base is immediately apparent. The new accessory - a digital watch incorporating a wind speed sensor, is mounted just in front of the steering wheel. 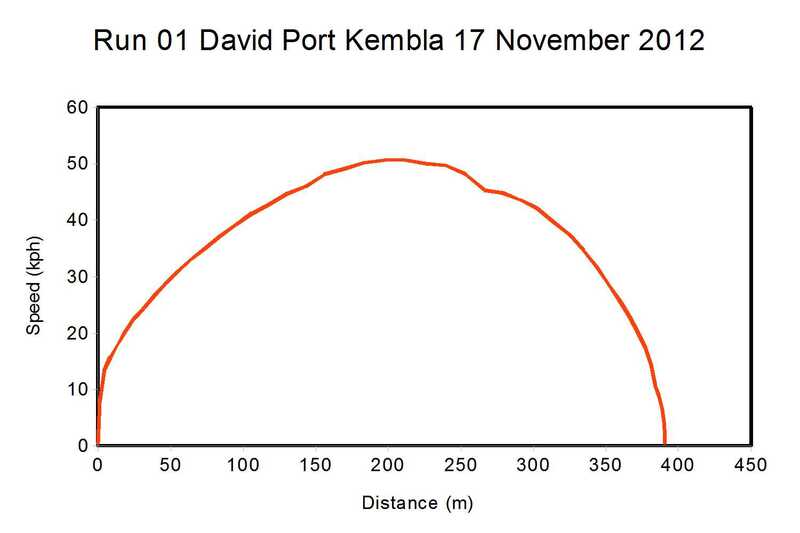 With better front tyres and wheels, and aided by a 4 kph tail wind, David managed to reach 55 kph down the 18 m high 220 m long Technopark Hill on the day. 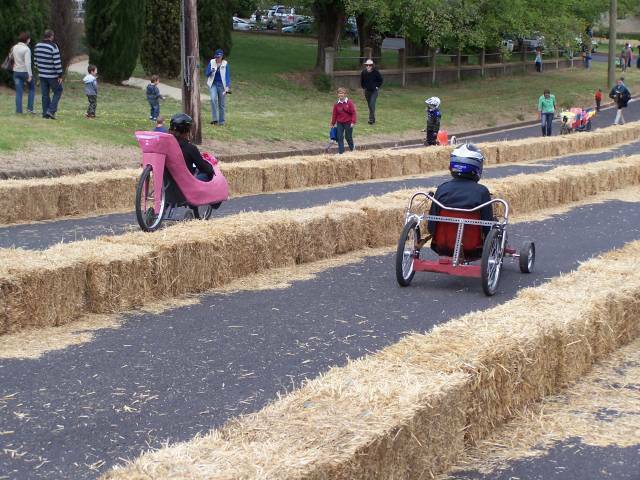 This photograph was taken at the Billycart Derby held at Baskerville Racecourse Tasmania. Peter Marendy is about to let David go on the start line. David is sitting up on the back to get an extra 600 mm of height, and will slide down right into the body as the speed picks up. On the day, David came 3rd, with a speed estimated at about 55 kph. This is the same cart as shown above, but fitted with a masonite ("Burnie Board") and duct tape cover. 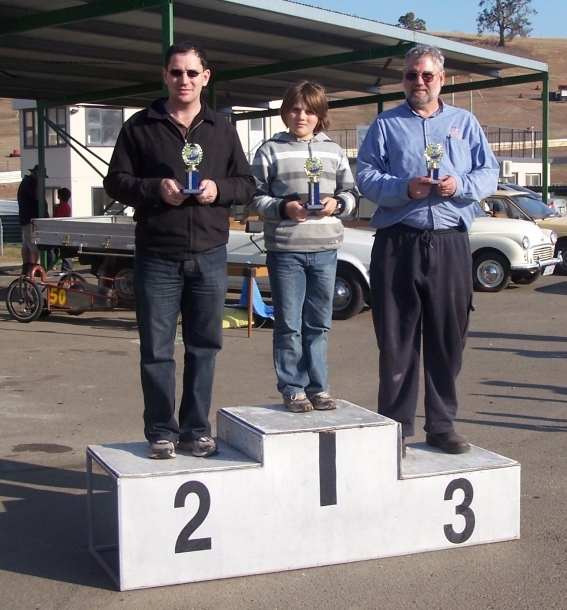 This picture, taken at Baskerville on Sun 20 April 2008, shows Peter Marendy, Nicholas Marendy and David Edwards with the trophies they picked up on the day. 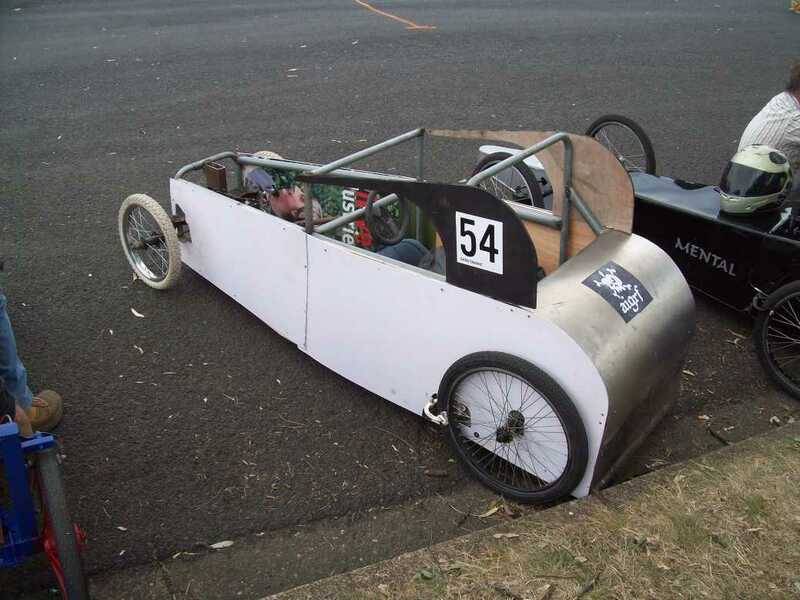 As the base shows, we got a 1st, a 2nd and a 3rd, all in billycarts constructed by David, with help from Peter Marendy, Ben Marendy and John McCulloch. These are some photos of my new billycart taken at Will's Man Shed where we used his lathe to drill holes in either end of the steering rod. The brakes have yet to be connected, and yes, I know the tyres need pumping up!! 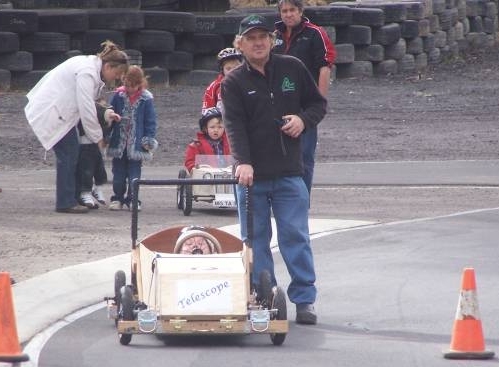 Telescope had its first outing at the Braidwood Community Bank Billy Cart Derby on Sunday 2nd May 2010. Construction was completed at 1pm on Sat 1 May, and Telescope successfully loaded into the Kangoo for the drive to Braidwood. On arrival, we had a great meal in the local pub with Jane and then retired to our pre-warmed motel room. We rose with the sun on Race Day, to be greeted with a clear sky - an excellent omen. On the track at 8:30am, Kerry and David registered as Drivers while Telescope was scrutineered. Then we lined up with the other Open category entries and waited for the call. Our concerns about the starting ramp proved groundless, as shown by David's first run, when he easily won his heat with a measured speed of 32 kph, despite an initial loss of energy as we scraped off the starting ramp. Much to David's chagrin, Kerry's first run - 2nd down the hill for Telescope - was much better, with Kerry reaching 34 kph and easily winning. So it seemed that Telescope was competive, and we settled down for the day. Kerry had a second run, again winning easily and progressing to the final of the Ladies Open category after a lucky draw. However, David's second run proved disappointing, as Telescope was easily beaten, knocking David out of the competition. This seemed to be due to David's heavy left foot on the left hand brake pedal (Telescope has coupled left and right pedals), as all seemed OK when David checked Telescope out after the race. It wasn't long till the big moment arrived - the final of the Ladies Open Category. Kerry came second, as Telescope again proved sluggish. With hindsight, it seems that the brakes are dragging only when the driver is installed - not easy to check as the wheels can't be test-spun while loaded, so David will investigate in due course. Billycart racing of course is only for fun, so it was with great pride that David watched Kerry receive her trophy and a voucher for $50 at the local IGA store. 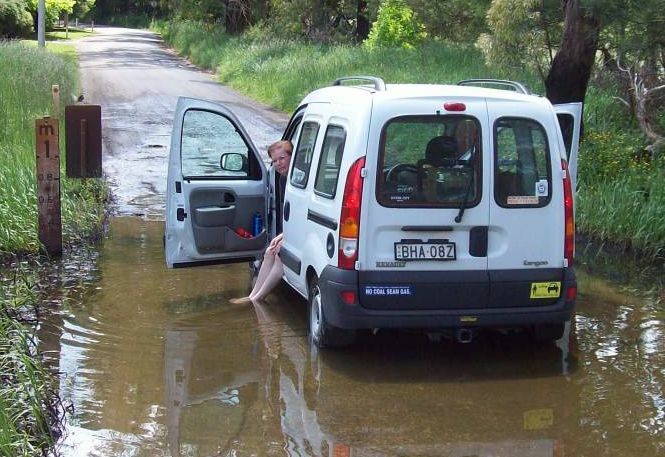 Then it was time to telescope Telescope back into the Kangoo, and set off on the drive back to Sydney. This was much slower than expected, as an accident on the freeway caused long delays. David and Kerry would like to express our appreciation to the Braidwood Lions Club and their sponsors, who organised a very successful and enjoyable day. 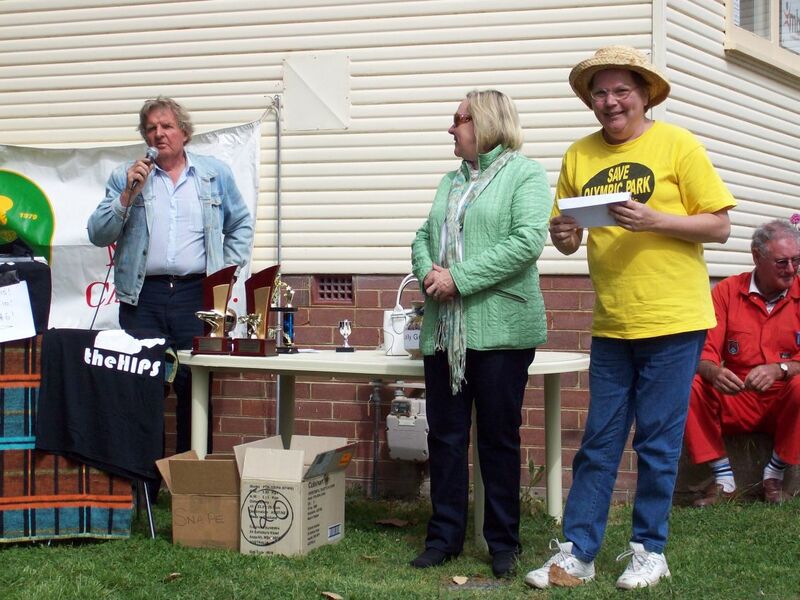 There were over 100 entries, so it was somewhat hectic at times, but the Braidwood Lions rose to the task. Thanks especially to Laurie, the dominant Lion, who made sure it was a great day for all of the community. The Lions Club of Braidwood can remember the day with pride. 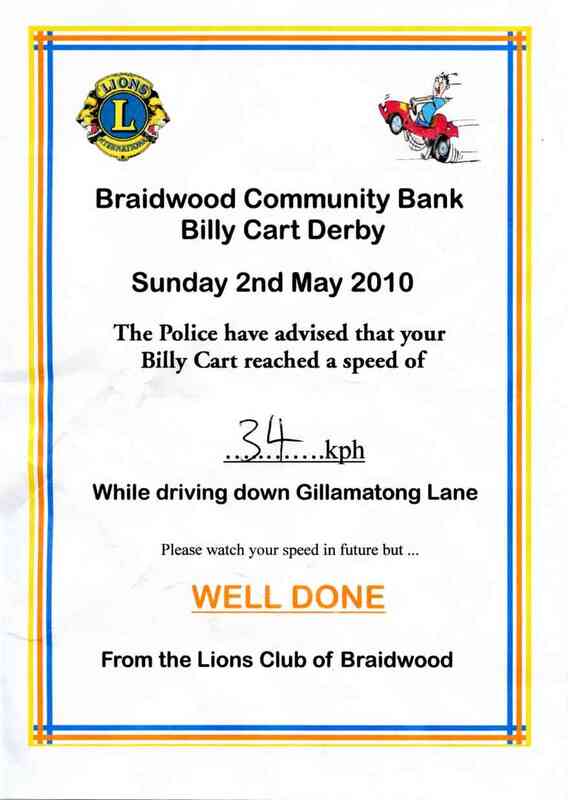 To find out more about the Braidwood Community Bank Billy Cart Derby, go to the official Derby web site at http://braidwoodbillycarts.wordpress.com/. 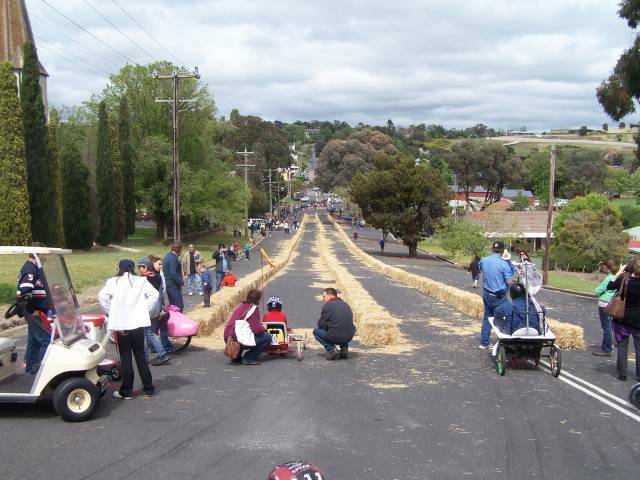 To see the track, look at Gillamatong Lane, Braidwood on Google Earth. There is a streetview picture which shows the course looking up from the bottom. 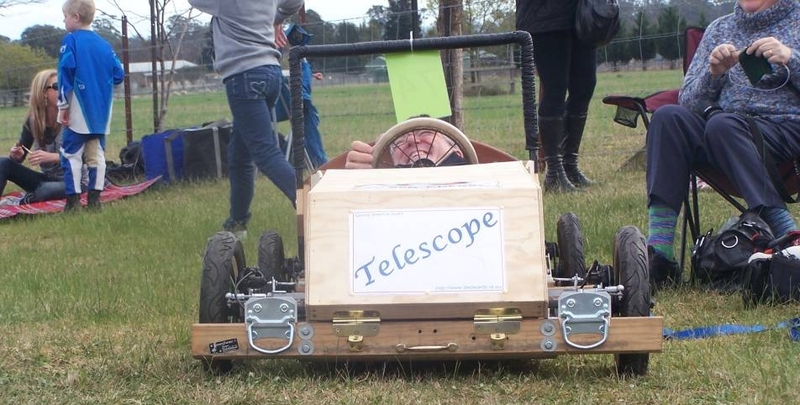 Telescope had its second outing on Saturday 6 November 2010, at the Classic Yass Rotary Billy Cart Derby. Kerry and I drove to Yass on Friday night, and stayed at the Hi-Way Motor Inn - good value for money. Since the Braidwood races, David had rebuilt the front steering assemblies, making them a lot stronger. 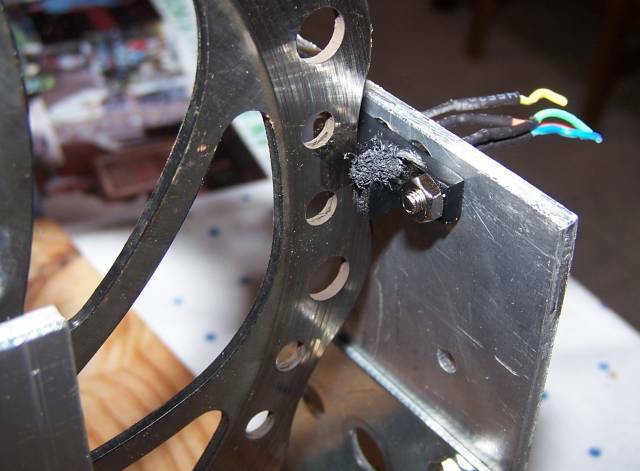 He also manufactured a cover for the infra red wheel counter sensor on the LHS rear wheel and relocated the wheel sensor for the bicycle computer, in an attempt to avoid the previous failures. The fun started early on Saturday morning, when we met with the organiser Kim Turner, found the pit area and unloaded the Kangoo. Once the course was set up, practice started. David had a couple of practice runs, and all seemed well. The bicycle computer still failed to work, but the laptop and data logger was fine, as was the front steering. It seems that the mechanical problems seen at Braidwood had been fixed. Once practice was over, the kids classes started. There were a few spectacular spills, giving the hay bales a workout, but fortunately no serious injuries. After lunch, we spent some time looking at the cars (including a nice Morris Minor Traveller), the racing cars and the second hand market, all part of the Classic Yass Festival. Then it was time for the billycart racing. Kerry had three runs in the Ladies Class. 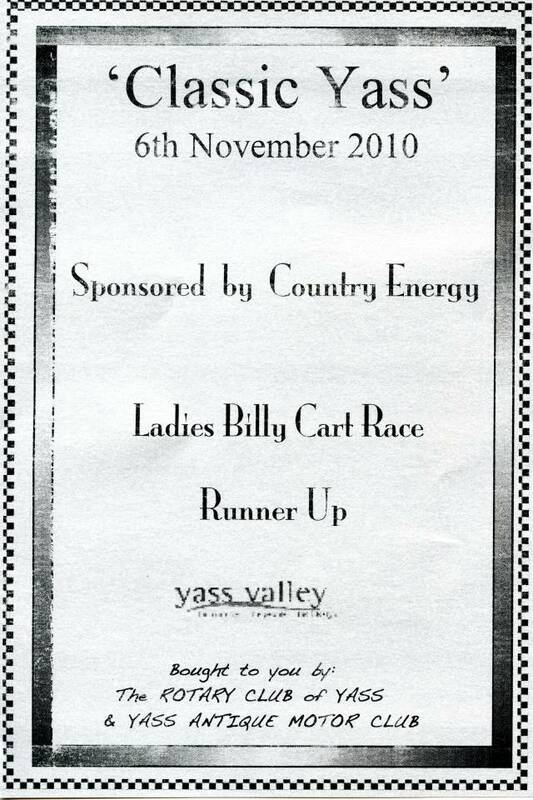 At the end of each run, all competitors received an Encouragement Certificate which incuded some discount vouchers. Kerry made it through to the Grand Final, where she was just beaten by a Pink Slipper!!! Telescope performed flawlessly, although it was a bit bumpy at times. The 4 wheel disc brakes proved excellent at stopping in the short distance provided at the end of the course. Then it was David's turn. He had five runs in all, with the second run being judged a dead heat, and hence repeated. Luckily, David won the re-run, and then continued to progress towards the Grand Final. In the Grand Final, it was neck and neck down the hill, but unfortunately the Pink Slipper proved to be just that bit slipperier. But David was well satisfied with his 2nd Prize Certificate and $100 cash. After all the racing was over and the prizes presented, David downloaded the technical data from the laptop. The mods to the wheel counter had proved successful, and there was good data for the whole day. Top speeds were all very close to 50 kph, in accordance with the police radar measurements. Each run was completed in about 24 seconds. Acceleration at the start of the course was about 0.1g, but it was noticable that Telesope continued to accelerate all the way down the hill, albeit more slowly at the flatter second section. Note that for a 12 m hill, the theoretical top speed is 55 kph. After we telesope'd Telescope to get it back into the Kangoo, we had a coffee in Yass followed by a great Indian meal in Mittagong. We were home in time to get a good night's sleep in time for our normal Sunday cycling. Overall, it was a top weekend, and well worth the effort. 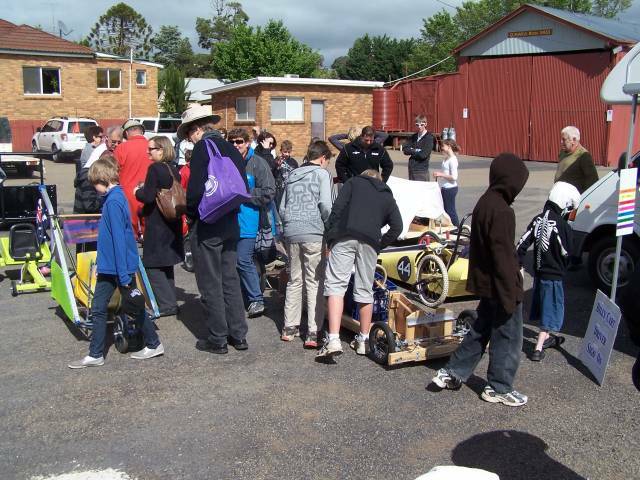 We would like to record our thanks to the Yass Rotary Club, and in particular to Kim Turner and his helpers, who had everything well organised, even the weather, which was just right - not too sunny or windy and with just a hint of rain. Telescope's 3rd outing was at Nelson Bay on Australia Day. Seat belts and a roll bar had been fitted, and motorbike helmets acquired to comply with the rules. The Nelson Bay course is quite challenging, starting with a steep ramp, speeds of up to 50 kph, and concluding with a sharp left hand corner. Telescope was not up to the forces involved in coming off the ramp, and in the final corner. A bent rear axle led to the rear brake disk demolishing the opto-interruptor, so we only got one run of data. As you can see above, the sensor failed abruptly at 290 metres. As you can see from the photo at the left, the disk was very good at chopping the plastic sensor to bits. But overall it was a fun day, with both David and Kerry having fun!!! Our next outing was to Blayney. As you can see in the photograph, additional supports have been provided for the rear axles. The front axle mechanism (hinge king pins etc) was also strengthened. 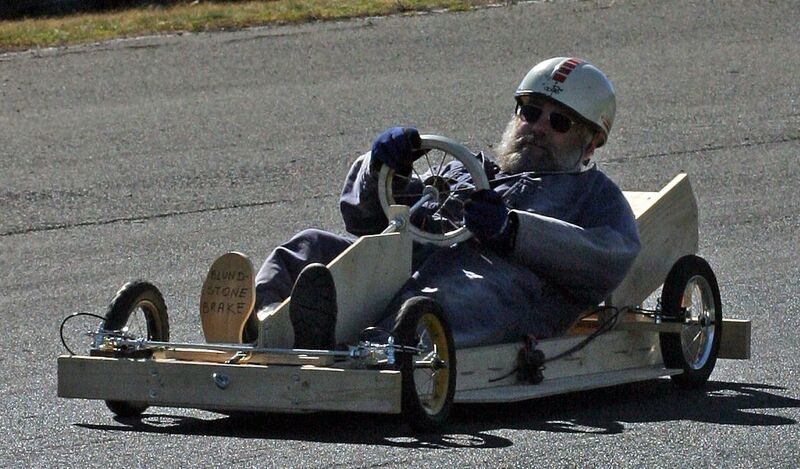 Improvements to the billycart software seemed to be a mix of good and bad, as no sensible data was obtained. However, as usual we had a great day. After a year, we returned to Braidwood for another great day of racing. Telescope has now been shaved at the front and the rear to increase the ground clearance. This time, with revised software, the logging system worked well. As you can see from the data, we were relatively consistent, obtaining speeds of up to 35 kph. This compares well with our performance in 2010. We didn't win any prizes, but we had a great day as usual. Telescope was still being held back by the the front wheel alignment, which was varying with the axle loading and causing the front tyres to scrub. We took the opportunity to stop at the Indian restaurant in Mittagong again for another great meal. 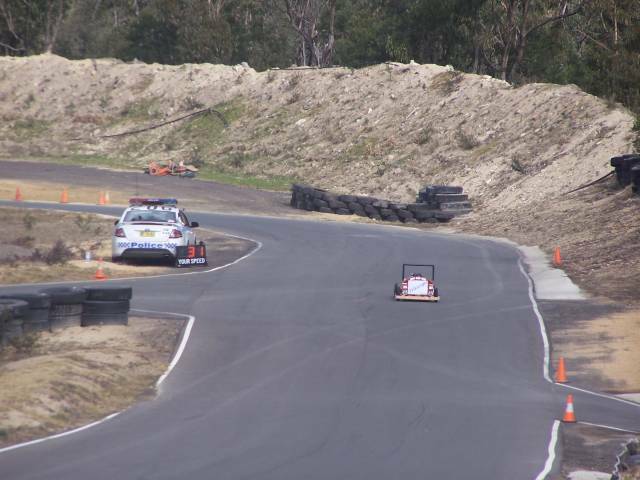 The Gosford course is quite short, and again a ramp start is used. Even with the increased front and rear clearances we still scraped coming off the ramp. Telescope is also no longer naked - a plywood body has been added, complete with a tonneau which unfortunately suits David only. It has also been streched by 50 mm to allow David to lie down fully. 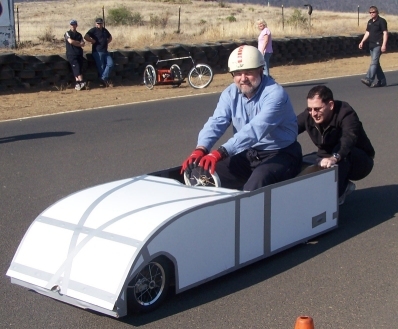 The body is detachable, so we can now race with and without the body. With revised software, the data logging system is working well. Performance was very consistent, with speeds close to 40 kph. 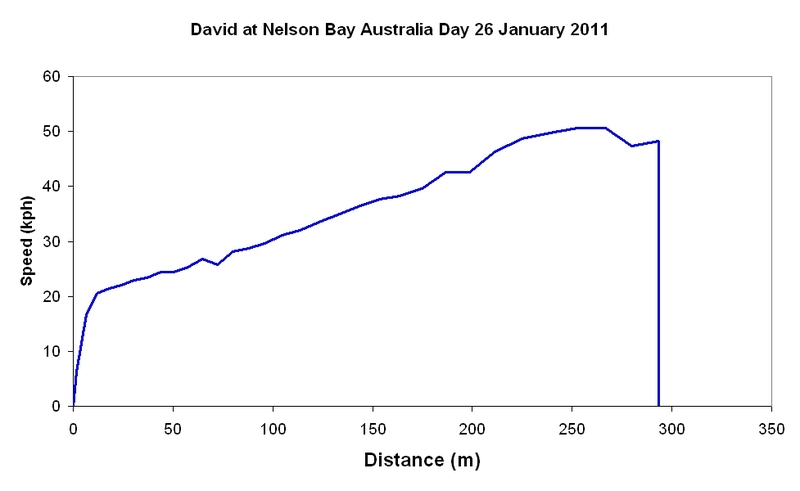 From the average data, I was able to calculate the hill profile, and hence the maximum speed - about 41 kph. 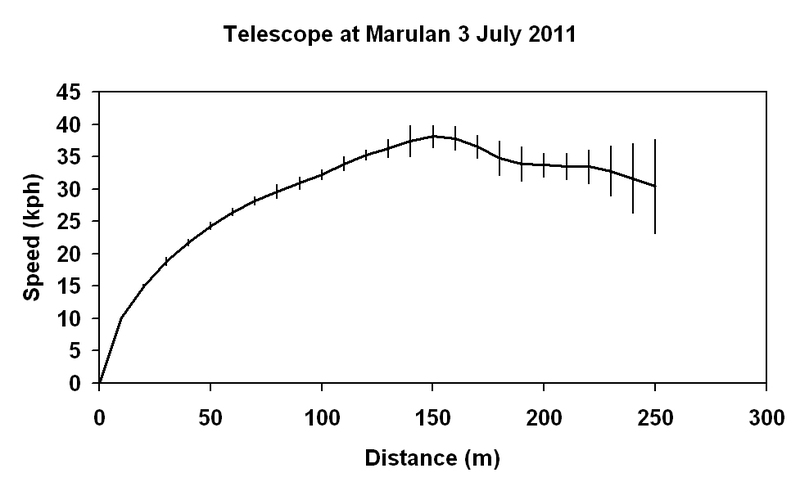 Using the period of constant decceleration on the flat part of the course, I was also able to calculate Telescope's drag as being about 30 Newtons. With some help from Jim, I have upgraded the hinge king pins, and we are looking forward to better performance at Marulan on 3 July 2011. Telescope had another enjoyable day out. After the previous race at Gosford, with the assistance of Jim Maniolidis, the front king pins were replaced. The new custom hinges are very strong, and prevent the toe in and toe out changing as the front of the cart is loaded. 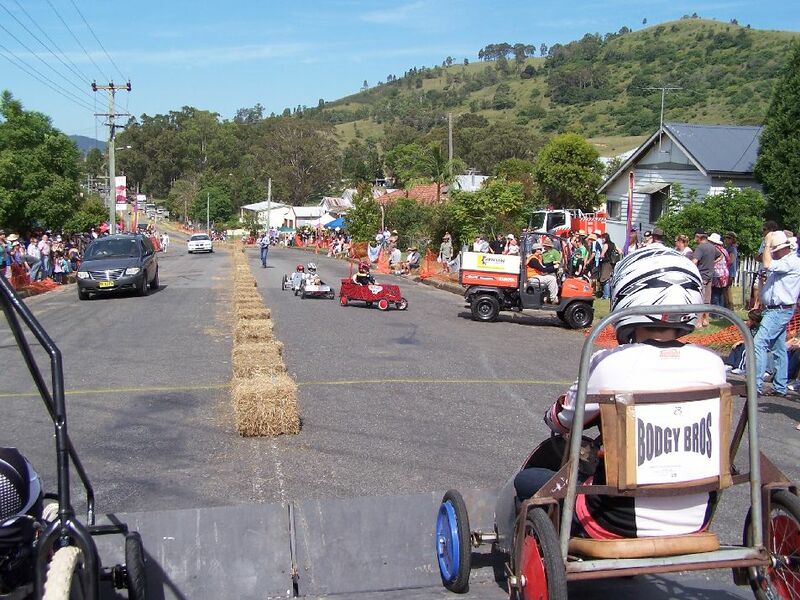 The Marulan Driver Training Centre Annual Billycart Races are held on a small hill, and are speed trials rather than races. The carts are released manually (no ramp) one at a time, and the maximum speeds recorded using a police radar. The fastest speed on the day was achieved by Jim Maniolidis in Cobra. Kerry and I got 9 runs between us, 5 for David and 4 for Kerry. The last 3 runs (2 David, 1 Kerry) were with the body removed from Telescope. 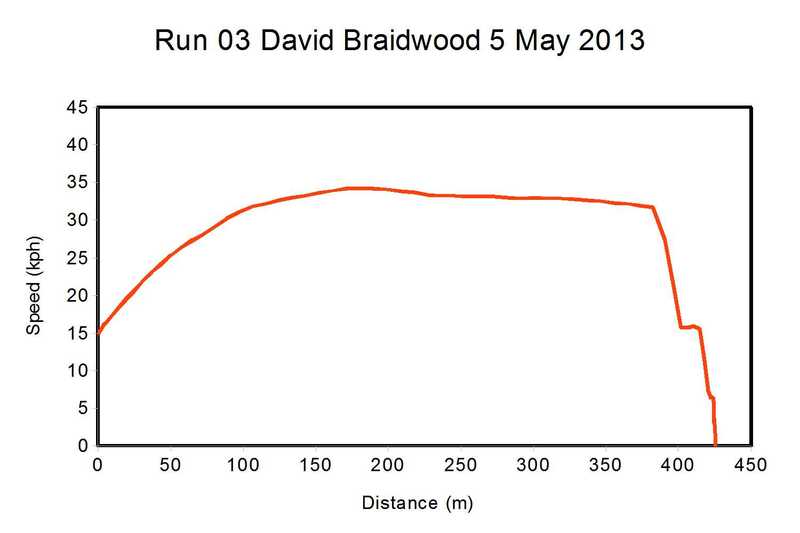 Our speeds were very consistent - 36 kph for the first 5 runs, falling to 35 kph at the end, even with the body removed. The data logging system worked well, recording all nine runs. 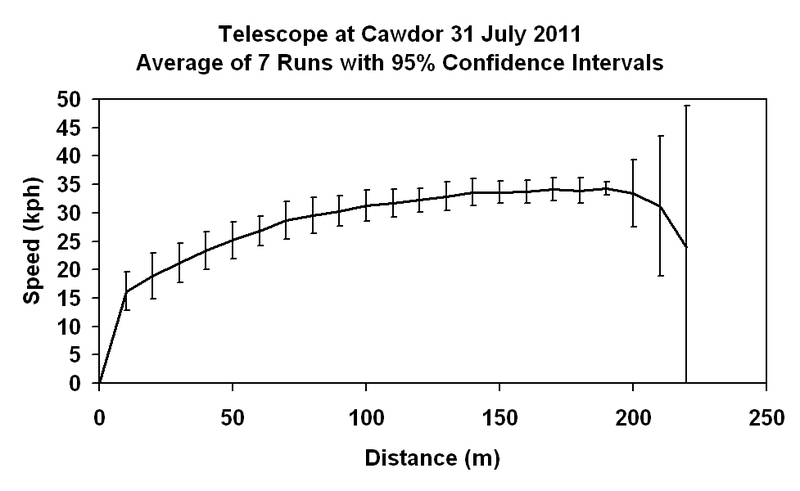 The graph above shows the average of all 9 runs. The error bars are the 95% confidence limits. As expected, the error bars increase gradually from the start, and are largest at the end of the course where Telescope is braking. Images courtesy of a flinty fellow!! 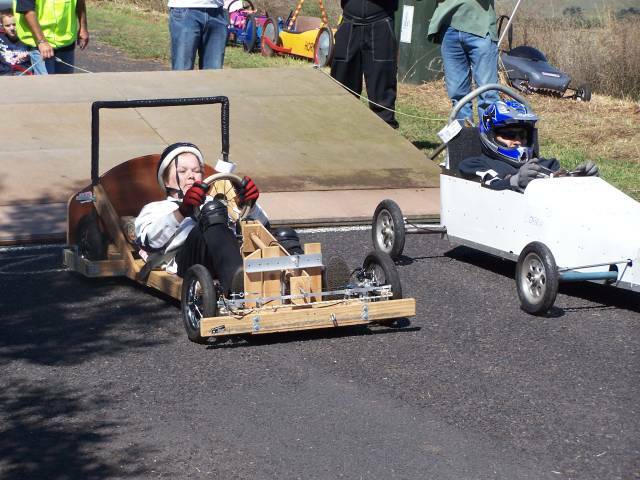 Great fun was had by all at the Cawdor Razorback 300 Billycart Derby. Telescope achieved its fastest speed ever - 110 kph while strapped to the top of the Kangoo (down the M4 on the way there!!! ), as we had installed the rear seat to allow Peter from Michigan to come join us for the day's racing. The course was 200 m long, and used a ramp for starting. 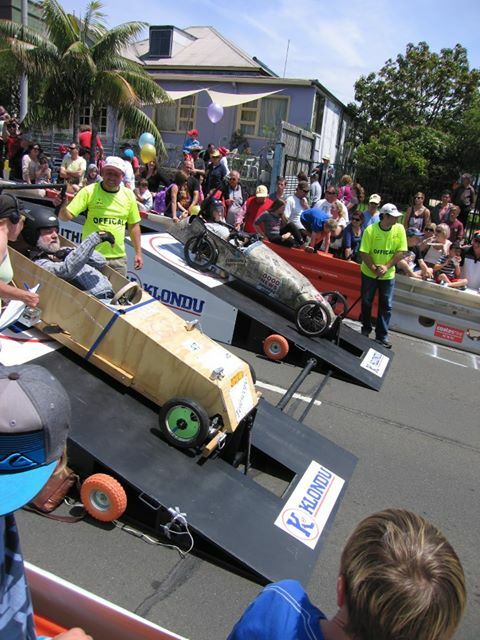 Carts went down in pairs, with results judged on timing. Pushing at the start was allowed. This had minimal effect on the maximum speed - not many people can run at 20+ kph* for very long!!! - but did reduce the overall time for the course by a little. The number of runs was limited only by how fast you could push the cart up the hill. We got 7 runs in, with an average speed of 34 kph. Our average time for the course was about 27 seconds. 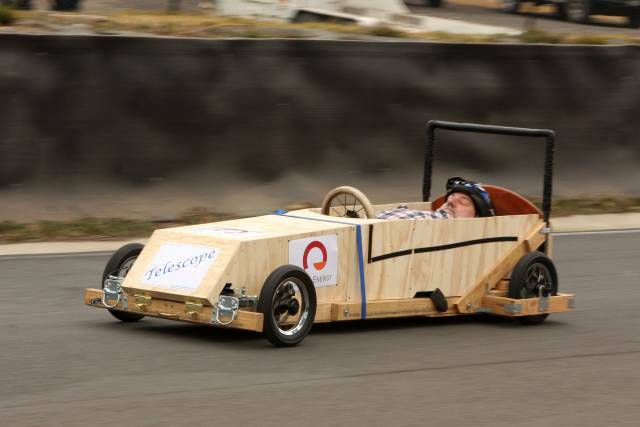 Kevin's cart had a new folding (front and rear) body - very ingenious!!! Our friend Jim in Cobra achieved fastest time of the day. Kerry is in the left hand lane, streaking to victory!!! 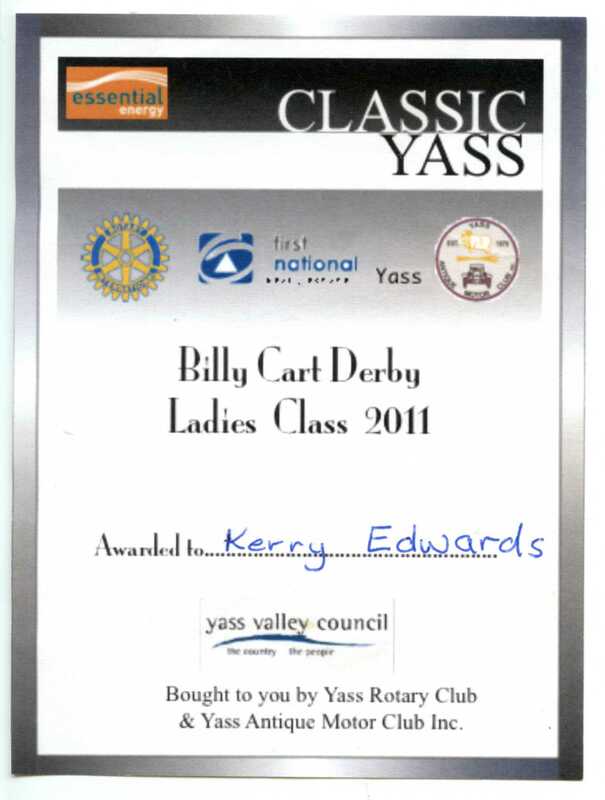 Kerry and David had a great time at the 2011 Yass Billycart Derby, staying for two nights so that we could go to the dance on the Saturday night. With slightly improved steering, Telescope performed well, allowing Kerry to win the Ladies Class. Victory was sweet, after her narrow loss last year. The instrumentation peformed well, logging speeds just over 40 kph. The Garmin Edge 200 David had purchased especially for this run confirmed these speeds, although the rate at which data was stored (about once every 5 seconds) proved disappointing. 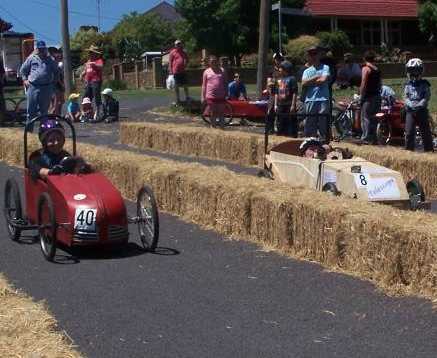 The Gresford Billycart Derby is held at Easter, so we can only attend every second year, as the Australian National Morris Minor Rally is also held every two years at Easter. Kerry and I each had one run, and I spent a lot of the waiting time helping operate the starting ramp. As you can see from the photo, there was a tow back up the hill. I tried out my new Garmin Edge 200 bicycle computer, but again the data was not much good. The Garmin only records every 5 seconds or so, so for a 20 second run down the hill you only get 4 data points. 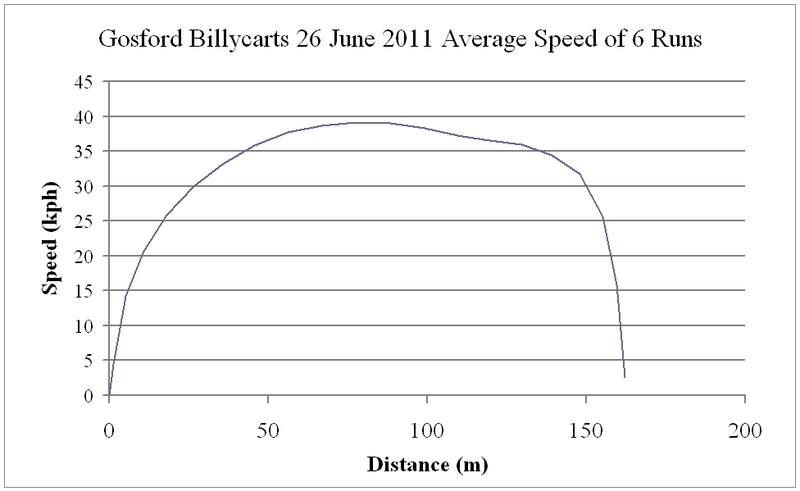 My BillyMon system gave reasonable data, with both runs reacing speeds of 40 kph. 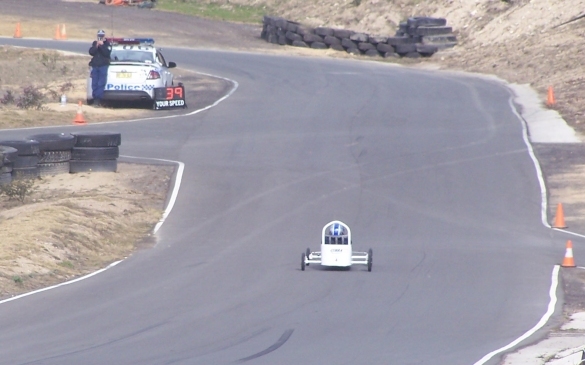 We had 4 runs, reaching speeds of up to 33 kph. Telescope wasn't the fastest cart on the day, but as usual we had excellent fun. We had 11 runs, reaching speeds of just over 40 kph - you can see why we like Yass. Kerry won 1st prize in the Ladies, so overall it was a great weekend. We stayed Saturday night as well as Friday night, so that we could go the the dance on Saturday night. We had a great time, as did Jim. Arduino USBDroid microprocessor kit. The BillyMotion system is completely self contained. It stores data at a 1 Hz rate on a micro SD card, and includes a 3 axis accellerometer chip as well as the GPS module. We had 5 runs, reaching speeds of over 50 kph. Unfortunately, the locals had edge on us in terms of speed, so we didn't pick up any trophies. The BillyMon (counts holes in the disk brakes) and GPS based BillyMotion systems both worked well, with the speeds agreeing quite nicely. A pleasant surprise was to see our friend Brent from Tasmania attending, unfortunately without his cart. 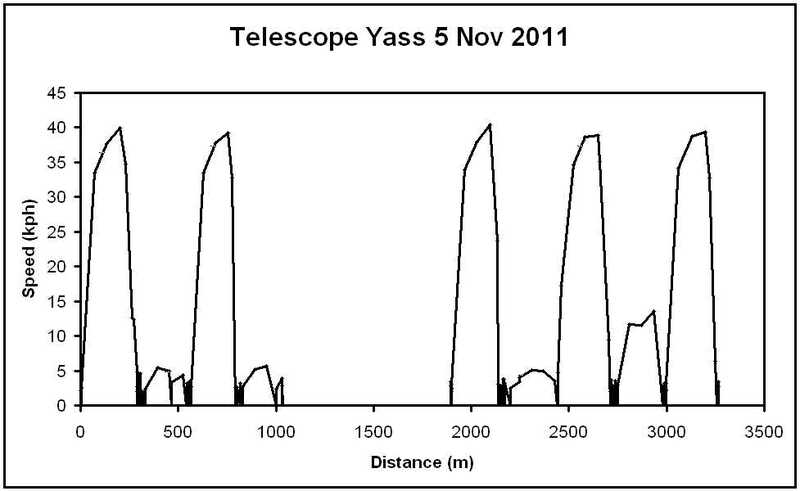 As per previous years, Telescope closely exceeded 35 kph down Gillamatong Lane, even with new 14 mm non-bending front axles. Kerry and I had 3 runs down the hill, with quite consistent speeds. 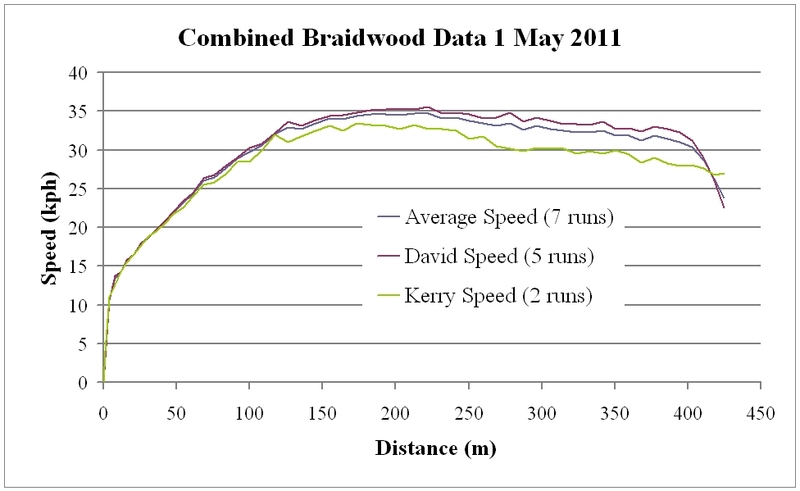 If you compare the shape of the curve in the graph below you can see how closely it compares with the 2012 runs at Braidwood. 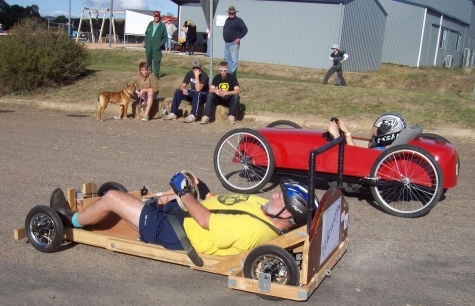 I have set myself two tasks befor ethe next race at Yass - to build a better streamlined body and at to modify the BillyMotion firmware so that the data recording starts as soon as the cart moves. This will be done by processing the accelleration data. 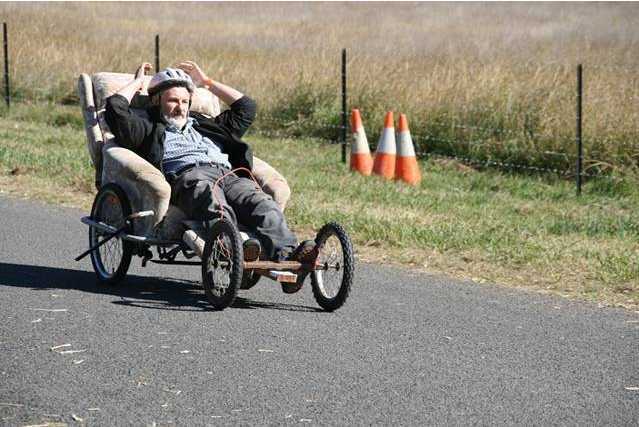 My new friend Paul from Braidwood has great plans for next year - I can't wait to see the improvements to his couch!!! 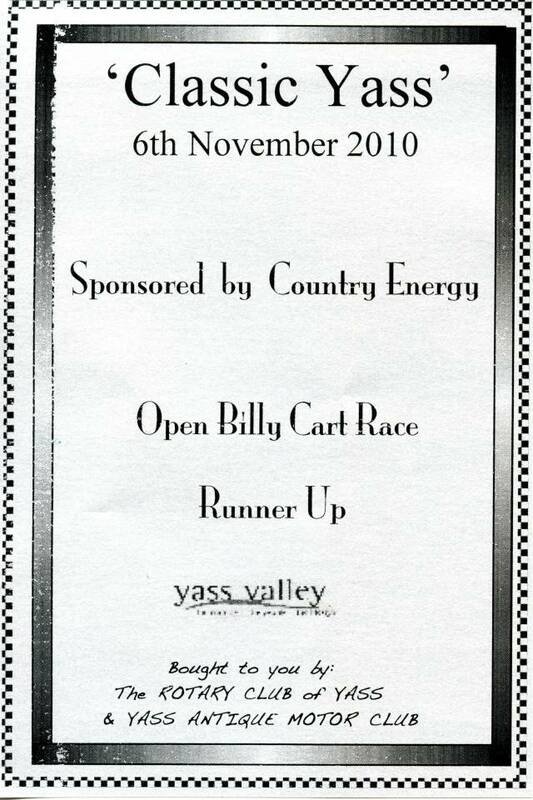 This was our 4th year competing at Yass. As usual, we had a great time, but a few things went wrong. The BillyMotion firmware didn't get modified - that's still on the To Do list. While a new body for Telescope is also still on the To Do list, I did manage to install 14 mm dia front axles to replace the existing hollow ones. This means that when the front axles are loaded, they do not bend significantly. The old axles used to bend enough to cause the front brakes to drag slightly. I didn't set up BillyMotion GPS logging system correctly, so I got no data at all on the day. I didn't take many photos either. Telescope went really well, with David getting a couple of runs in the Open Category, but loosing out in the end. Paul's new cart, which we had inspected in Braidwood a few months earlier, went really well. In fact, it went so well that he beat me!!! The really good news is that Kerry had a great time in the Ladies Event, and managed to win for a 3rd year in a row. But we missed the Prize Presentation, so there is no photo!! !